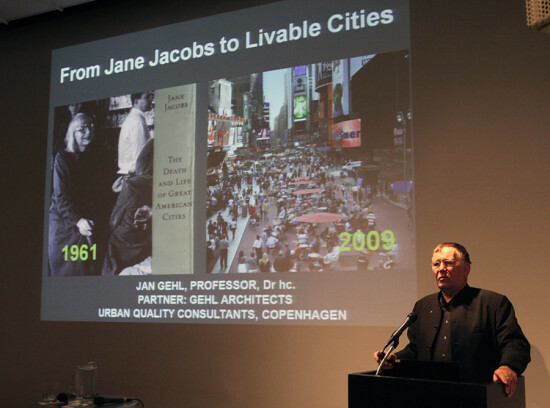 The Oculus book talk on the new book, How to Study Public Life, at the Center for Architecture with Jan Gehl and his co-author Birgitte Svarre was like seeing the documentary The Human Scale come to life—only with a sense of humor. Gehl’s urban theories have gained a lot of traction, not least in New York City. Jeanette Sadik-Khan went to Gehl’s native Copenhagen two weeks into her job as commissioner of NYC’s Department of Transportation (along with fellow commissioner of City Planning, Amanda Burden) and experienced the city’s pedestrian-over-cars public plazas, rode bicycles on protected bike lanes, and absorbed the lessons of the city that is repeatedly named the most livable in the world. The 77-year-old Gehl traces his crusade back to a New York antecedent, Jane Jacobs’ 1961 Death and Life of Great American Cities, published one year after he graduated from architecture school. He was trained to make free-standing buildings that “look nice from an airplane,” but married a psychologist who challenged him: why aren’t you interested in people? Gehl began to observe the behavior of people in cities (people like to cluster near the edges, not stand in the open, for example) and came up with measurable statistics in a series of studies that began to influence policy. In 1962, Copenhagen pedestrianized its first street, Stroeget Street, which began its transformation from a car to a biking and walking city. Today, Copenhagen has seven times more people space than in the 1960s, and all taxis and public transportation are legislated to have bike racks to widen the reach of this preferred mode of transport. I was reminded of the new film, Copenhagen, winner at the Slamdance Film Festival, where the human-scaled city traversed by bike is a main character. Gehl noted that the “Brasilia Syndrome” of cities that look good from the air but not from the ground, is still rampant in China, Dubai, and even in Brooklyn. He calls this birds-eye-view building “birdshit architecture.” His twin devils are the two M’s: modernism and motorists, and he’d prefer to have a Department of Pedestrians to a Department of Transportation (no city yet has taken on the challenge). Perhaps the proof that Gehl’s theories work is that in 2012, New York City was awarded the Lee Kuan Yew World City Prize recognizing the transformation of the city during the Bloomberg administration.